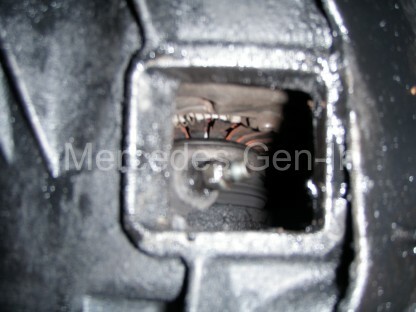 Clutch replacement on any vehicle can be an expensive job, especially if you are entrusting the job to a main dealer. 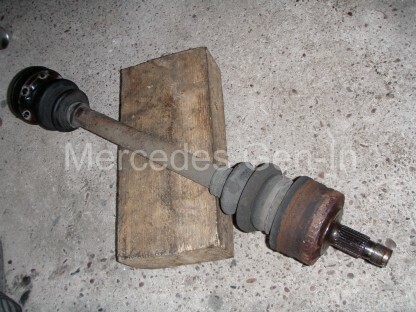 Although large scale and a little mauling, clutch replacement on Mercedes models can be well within the capability of a competent DIY’er with only a limited number of tools. 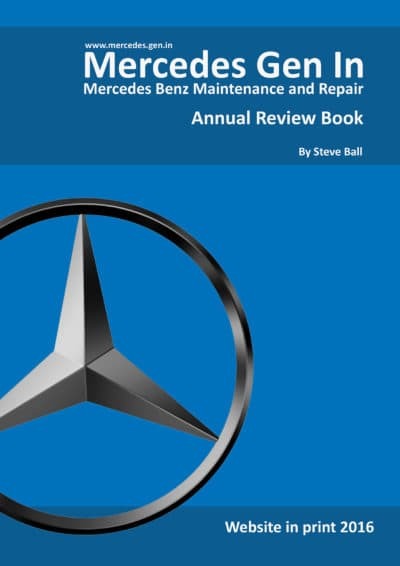 In this post we shall look at the replacement of the clutch mechanism (including Dual Mass Flywheel DMF) on the Mercedes Sprinter – both older and newer models. There are several important details often overlooked about the Self Adjusting Clutch mechanism or SAC, that the installer has to be aware of so that things go smoothly. You will no doubt have read many horror stories on the web of people installing SAC clutch units only to find that on re-assembly they have no functioning clutch, then having to take it all apart again to do it properly! The first thing to understand is how the clutch actually self-adjusts over its life and in this understanding it will allow you to assemble things in the correct manner, so when you put that last bolt in place you are certain things will work as they were designed. If you are fitting used components, such as a second hand DMF (flywheel) or even a complete used clutch, this knowledge is ever more important. 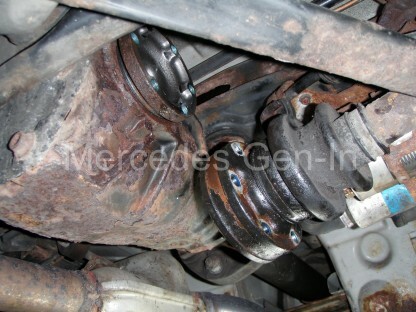 You would also additionally need to know how check this if you were stripping and replacing the original clutch and flywheel from an engine only to replace it later, say if you were replacing a leaking rear crank shaft seal for instance. You will remember from days of old that clutches on older vehicles used to have a different bite point as they aged, either right at the bottom or top of stroke depending on design. This is not the case today with advancements in clutch technology. 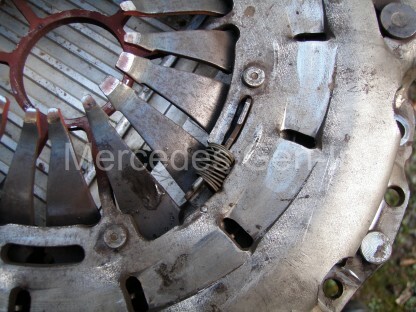 Mercedes clutches and other vehicles too, now have circular adjusting mechanisms built into the cover plate and spring that move to compensate as the clutch wears, maintaining the release spring pressure and finger position. 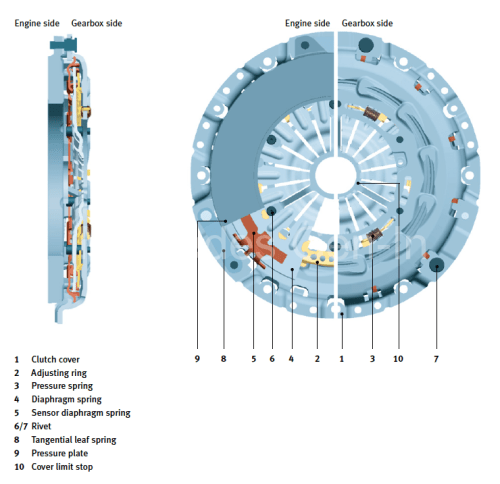 This means that as a SAC clutch ages, it maintains the same spring operating position and ensures a constant actuating force to engage/disengage the clutch over its life. Indeed it is almost impossible to tell if a modern clutch is ‘new’ or only ‘weeks from failing’ by the pedal position and feel alone – all thanks to the SAC. 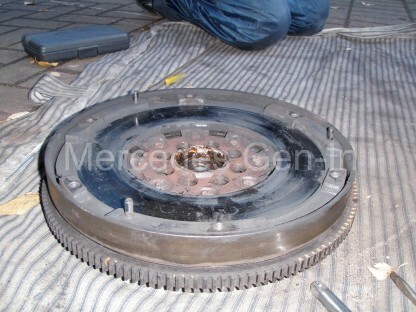 When you purchase a new clutch kit you will almost always find that the clutch has been ‘set’, and is ready for installation. However it is always best to check that things are correct before fitting as I have known due to rough handling even new cover plates ‘spring’ into a full adjustment position – clearly fitting this as-is would result most probably in a non functioning clutch. From the illustration above you will see the cover plate/spring assembly has an adjustment ring. (2) Simply put, this circular ring is allowed to rotate if required a few degrees when the diaphragm spring is fully compressed (when the clutch is operated) Its rotational resting position is controlled by the combined action of a sensor diaphragm spring (5) and the main diaphragm spring (4), allowing the plate to slide round slightly, facilitating changing the pivot point of the main clutch springs as the driven plate wears. There are three small springs that pre-load the adjusting ring so that as the clutch wears the adjustment ring is forced to rotate slightly to drive what is in effect a ‘wedge’ into the forming clearances of the cover plate diaphragm spring at its pivot point, thus allowing clearances to be ‘auto adjusted’ within the installed cover plate. More information about the SAC from LUK if you wish to view here. 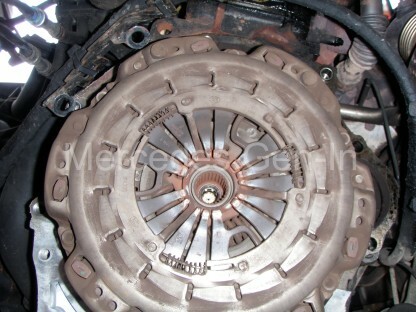 The adjustment ring’s spring position can be seen to be fully extended on this worn clutch cover plate below, the photograph below that shows the adjustment ring in ‘set’ position, this is how the clutch needs to look before fitment. Always check this before installing the cover plate, even if just out of the box! 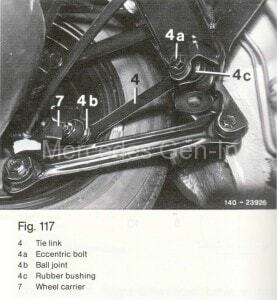 There are many expensive tools used for correctly setting the adjustment of the pressure plate once installed on the vehicle, whilst these are great to own, unless you fit clutches every day it is hard to justify their purchase, this post outlines how it is possible to carry out this work without the special setting tools. If you are using a used clutch, or simply refitting your original plate, it is important to check or reset the adjustment ring to the ‘set’ position shown in the photograph directly above. This can be achieved in a press used between the stamped steel cover plate edges and the diaphragm springs. If you do not have access to a means of compressing the diaphragm springs so that the adjustment ring can be counter rotated and reset, you may wish to read on, but use great care – as there is a fantastic amount of pressure behind those diaphragm spring fingers and a truly huge amount of force is needed to compress them! The following is an emergency measure, only to be used to get you out of trouble and is definitely not by any means a recommendation. On a solid driveway, place a hydraulic trolley jack under the rear axle of the vehicle and raise it enough to fit the cover plate, supported on three stout short wooden blocks of the same size, resting on the flange/outer lips of the stamped steel plate only, NOT the pressure plate (form the wooden blocks into a triangular formation). Using a very large socket that will generously cover the hole in the centre of the diaphragm springs, align this with the axle beam or lower shock absorber mount – use solid wood packing as needed. When in position bring down the jack ‘very slowly’ to allow the axle weight of the vehicle in controlled contact with the socket via the wooden packing, depressing fully the diaphragm spring, almost to the cover limit stop. (shown in cut away diagram above) Now carefully rotate the adjustment ring anticlockwise with a stout screwdriver until it rests fully against its stop and the three small springs are fully compressed. Once achieved, jack the vehicle once more and remove the cover plate that is now set for installation. Throughout this procedure please consider your own safety at each step of the way! 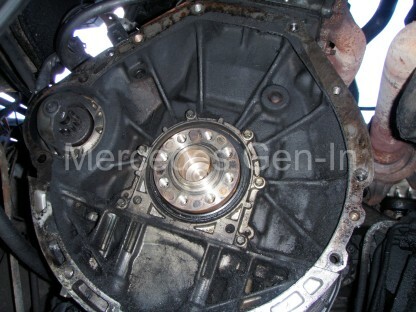 Now you can begin to remove the gearbox and fit your clutch. 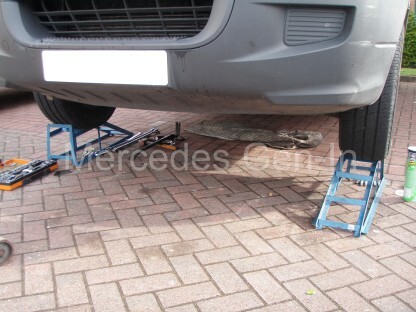 Working from ramps with additional additional 4-6 inch raising blocks if you have them, is the best way to achieve enough space to work comfortably around the gearbox, leaving yourself enough room to manoeuvre freely and eventually remove the gearbox from beneath the vehicle. I always jack the vehicle onto ramps, this allows you to place one ramp forward and the other facing rearward, thus locking the vehicle from rolling either way to supplement the handbrake and rear wheel chocks. Disconnect the battery before starting any work, as you will no doubt disturb the starter motor during the job. Also on later Sprinters, W639 Vito and VW Crafter models remove the complete air box from under the bonnet, this prevents any strain on the plastic components, as the engine naturally tilts backwards when the gearbox support is removed. Use a trolley jack to support the plate that supports the back of the gearbox near the output flange. Undo all the bolts that hold the support plate to the chassis rails on either side, allow the jack to be lowered and removed. This will drop the rear edge of the gearbox down a little so that the rear gearbox mounting pin can be removed and the support plate taken out from beneath the vehicle. 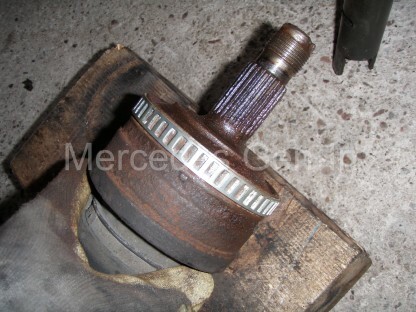 Using a 16mm socket remove the four propshaft flange bolts from the gearbox output shaft. You will now have to remove the drop protection ‘horse-shoe’ brackets and the two centre bearing bolts to allow you to drop the prop sufficiently to allow you enough flex for it to be moved out of the working area to one side of the vehicle. Now remove the gear selector cables, make sure you mark the shaft positions in the plastic ball-ends (amount of insertion) before you release them and tie them to one side. 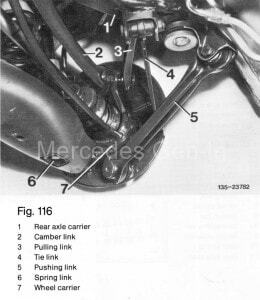 Put a latex glove under the cap of the brake/clutch shared master cylinder, before clamping off the flexible clutch hose from the chassis to gearbox. With a small screwdriver or pick, detach the hydraulic connection retainer clip from the gearbox hose coupling, keeping this in a safe place. Pull out the hose and again tie it out of the way of the working area. 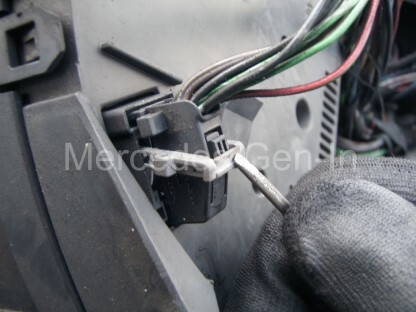 Remove any electrical connector or plug and tuck them out of harms way. 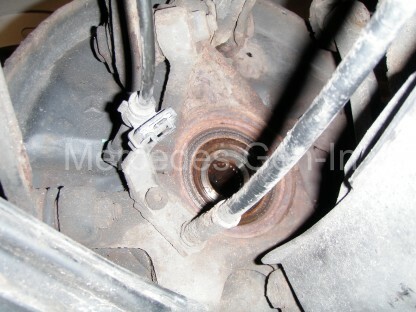 Now using at least a 24 inch extension bar and reverse torx socket remove all the ring bolts from the bell housing. 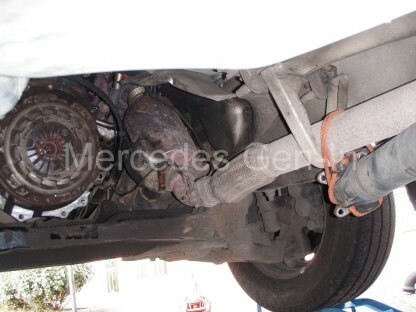 There is no need to fully remove the starter motor, just let it rest in position. It will be held in place by its thick cable. On T1N models up to 06, you will have to remove the exhaust support (2 x 12mm nuts) as this sits sandwiched directly behind the gearbox and will prevent removal unless fully removed. When you get to the last bell housing bolt, support the gearbox centre on the hydraulic jack, remove the final bolt. From the back of the gearbox pull, the casting should now separate from the engine block. Manoeuvre the gearbox back and lower the jack. 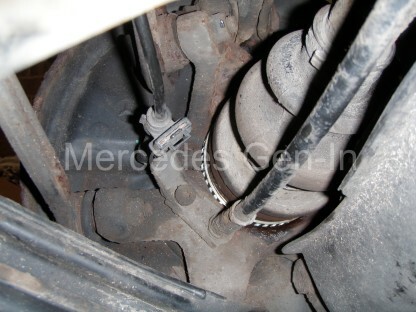 Take the gearbox from under the vehicle. This is a great time to check for leaks or damage/wear to the selector mechanism. Checking the gearbox oil level is easier at this point too! From inside the bell housing you can check the rotary smoothness of the thrust bearing, this is part of the release slave cylinder mechanism and cannot be replaced on its own. If you can afford it, always replace the slave cylinder when replacing the clutch, often if you purchase a complete kit it comes as a component part. 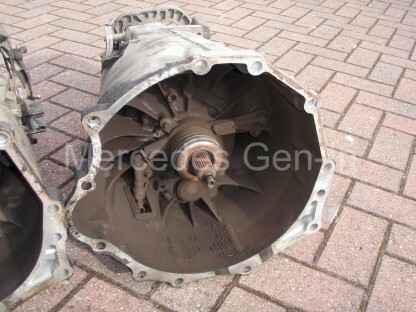 Always inspect the centre bearing in the DMF, if this is damaged it is not available as separate part from Mercedes only as part of the complete DMF flywheel! The bearing itself is a special construction of a blind roller bearing made by INA that acts directly on the input shaft end of the gearbox, this is concentrically inserted into yet another single row ball bearing race pressed into the DMF. Remove the clutch cover/pressure plate from the DMF, locking the flywheel with a small crow bar or broad screwdriver on the ring gear. You may have to pry the cover off its locating dowels, be aware it is heavy and it could catch you by surprise and fall on you! Once this is out, you can inspect the flywheel face for damage. The outer DMF section of the flywheel should only rotate independently about 10-15mm in each direction at its circumference in relation to the other fixed half, any more than this indicates the likelihood of a worn DMF. If you decide to replace this, you will need a long, large torx bit to undo the eight flywheel mounting bolts from the crankshaft. Once removed pry the flywheel from the crankshaft, it sits on a single dowel peg and can take some working to and fro to remove it. 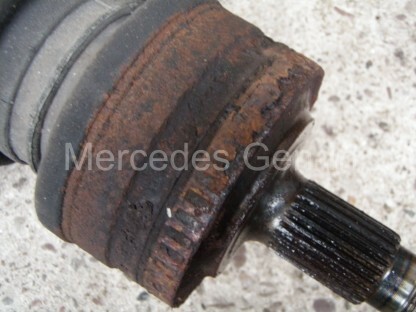 Always inspect the centre bearing in the DMF, if this is damaged it is sadly not available as separate part from Mercedes, only as part of the complete DMF flywheel! The bearing itself is a special construction of a blind roller bearing made by INA, that acts directly on the input shaft end of the gearbox, this is concentrically inserted into yet another single row ball bearing race which is directly pressed into the DMF. Replacement of all the parts is exactly as the removal, although be sure to reference the ‘set’ position of the clutch before refitting. Bleeding the clutch system can only be achieved with a Gunsons EzBleed or other pressure bleeding equipment, no amount of pedal pressing, as you would assume similar to brake systems will not work – trust me, you will be very lucky to achieve success otherwise. 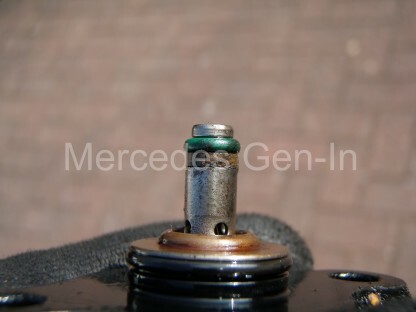 Once you have a good pedal feel and the slave cylinder can be seen to be pressing the diaphragm springs back and forth fully through the inspection hole, start the engine. Now press the clutch pedal several times, you should often hear a light clunk, this is the clutch adjustment ring finding its own position. Select a gear and test the clutch, all should be well. 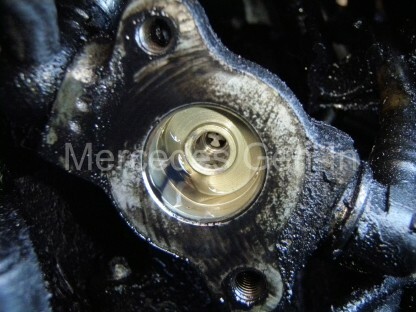 If for some reason it appears as if the clutch is not fully disengaging and baulking you from selecting a gear, check your work regarding air in the hydraulic system, if re-bleeding it proves to be good, then try starting the engine in gear, handbrake on, with the clutch down, this will often by inertia, force the adjustment ring from its set position to its new working position, a second pedal press should now settle it into its new operating position and you should have a good responsive light clutch. 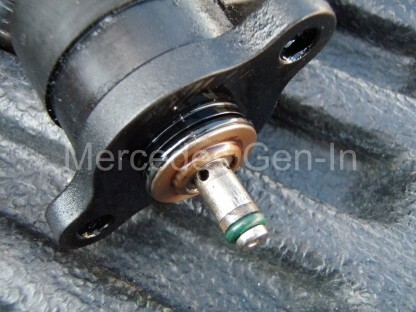 The Mercedes CDI series of diesel engines have an electronically controlled fuel pressure regulator mounted on the end of the fuel distribution rail. This controls, as the name suggests, the fuel rail pressure. It relies on the seal made between a single small O-ring which is backed by a split fibre backing ring. What happens over time is that the O-ring wears and often fails allowing pressurised fuel to bypass the valve and ebb away the required running pressure that the injectors need. 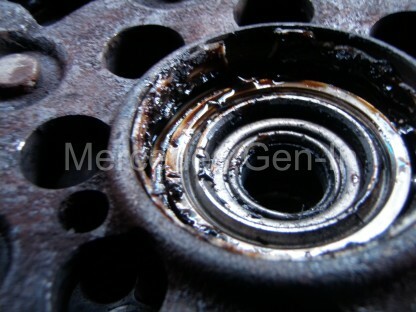 Often the problem becomes more noticeable once the engine is warm and poor starting results. Remove the upper section of the inlet manifold to allow access to the rear of the fuel rail, just under and against the bulkhead/firewall. Identify the electrical connector and remove it, select a 1/4 drive socket wrench and appropriate small reverse torx socket and short extension. Remove the two opposing pins on the regulator flange (left and right as fitted). Pull out the fuel pressure regulator from the end of the fuel rail. Keeping the device clean, remove both the green O-ring and fibre backing ring from the tip of the regulator and replace with new components. Refit the regulator assembly to the rail. It makes it easier if you have the left hand threaded pin in place in the regulator flange mounting hole, before offering it into place. (left hand in fitting position, if standing at front of engine) Once the two pins are re-fitted the electrical connector can be attached and the intake manifold upper half rebuilt. 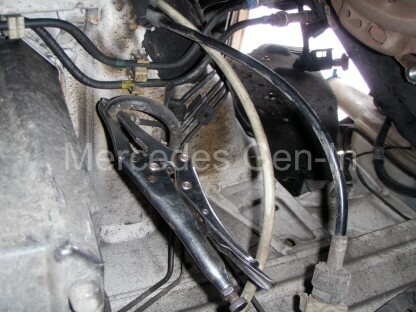 It is important to note that a failing fuel injector can also deprive the fuel rail of its operating pressure. If you suspect that this is the case, perhaps after changing the regulator O-ring to find there is no difference to the fault then you must carry out or entrust a garage to do a diagnostic ‘leak-off test’ to prove the injector system is sound. WARNING a failing fuel injector that is passing unmetered amounts of fuel can soon damage the engine catastrophically, either through piston overheat or engine seizure and any suspected problems must be investigated promptly! See this interesting and descriptive forum post regarding leak-off testing. From time to time you come across things that just amaze you, and this customers Mercedes Sprinter van was no exception. The van had come in with an obvious ABS fault, sensor wire physically and visually broken, and no warning illumination on the dash. Once the ECU was read there were in fact several faults related to the engine that should have illuminated the EDC lamp too, but nothing! After a bit of fuse-chasing and voltage checking, it seemed the problem was at the instrument pod end. It turned out the previous owner had removed the instrument pod, unclipped the PCB and prized it apart just enough to slide a small screwdriver in and break off the surface mount indicator LEDs. These should have illuminated showing the current faults. 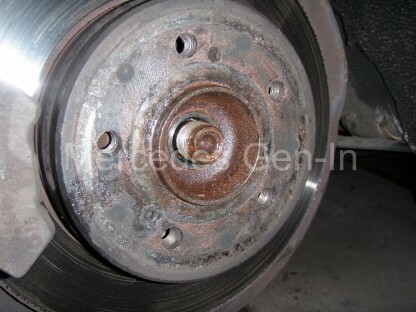 It was hard to say if this was actually a measure to disguise the faults so the vehicle could be sold, through maybe auction or otherwise or if it was a desperate attempt to get the vehicle through the annual MOT – Who knows… All I knew was that before any other remedial work could be done this sensibly had to be rectified first. To gain access to the Sprinter instrument pod, first prize off the light grey facia moulding that contains the drivers air vent and switch banks. Tilt this around the steering wheel and let it hang to the floor with switch cables still attached. 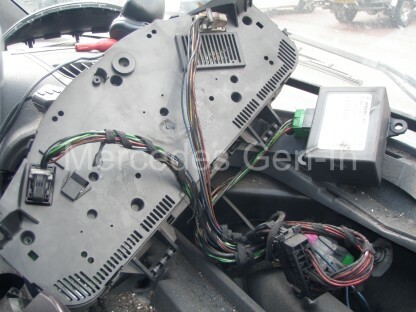 If you have more options and switches in place on both sides of the steering wheel it is best to label each and remove the electrical connectors from the switch backs, removing the panel completely. Do not be tempted to not mark what comes or goes to where, as several of the switch options have the same plug shape format with only different pin layouts. It is entirely possible you can plug the wrong loom plug into the wrong switch as they will fit! 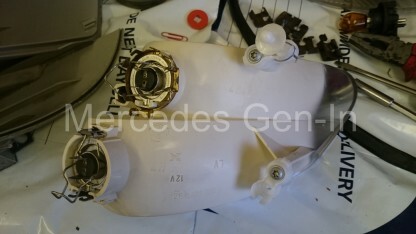 The removal of the facia reveals two screws either side of the instrument cover, these can be removed and the instrument cover lifted off and out of the way. 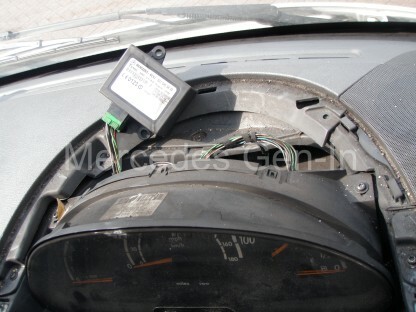 A further two screws either side of the instrument cluster hold it in place and once removed the assembly can be pulled forward from the top, disengaging it completely. On the rear cover of the cluster you will see two multiway connectors, one grey/white one black. These have a special locking latch mechanism that releases them from the PCB. Just behind the lever on the plug body shell is a small press-in latch, once pushed, the locking release arm can be drawn over it and arced downward to horizontal. 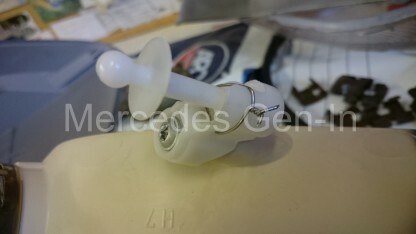 The action of moving this lever pulls and ejects the connector from its mating part, enabling it to be easily released and fully disconnected from the cluster. Unlatch both connectors and remove the instrument cluster to a clean work surface or bench. Around the removed instrument cowl is a series of clips, three at the top and bottom and one each side. Carefully unclip and release these, lightly pulling off the front cover of the instrument pod as you go. 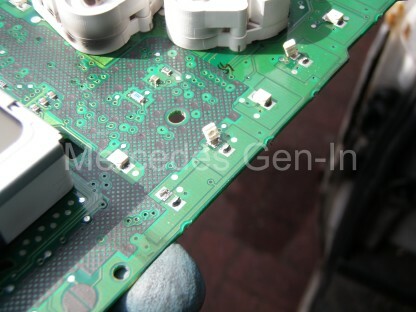 Once totally free the back cover can also be pulled from the instrument PCB. 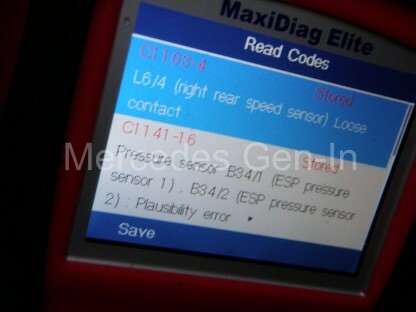 To gain access to the LED indicator lamps you will need to pull off the dial servo motor indicator fingers. Grasp the centre black covers and unclip them, making note at this point of what came from where. 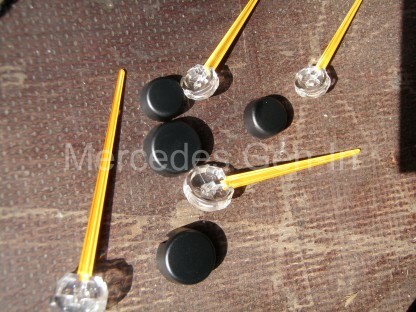 Then grip the indicator pointers by their central hub and ‘pinch’ them off the spindles between forefinger and thumb. Be sure not to rotate the gauge stepper motor spindles as the correct position of the pointer will be lost. This will make repositioning the pointers difficult – without further powering up of the instrument cluster to reset the base zero positions, then agin aligning and refitting the indicator needles to accurately point to their associated rest positions. Once all pointers are removed, the black instrument face can be removed from the PCB. This is done by unclipping a series of protruding white clips at the back of the board. Once these are released the two parts can be separated, revealing the indicator LEDs at strategic points on the front face of the PCB. Positioned so they illuminate and channel light to backlit icons screen printed on the instrument face. You can see from the photograph above what state the warning indicators were in and how they had been crudely levered/broken from the board. 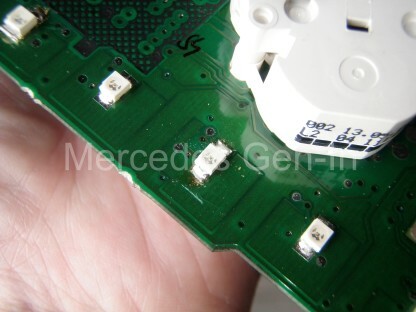 Fortunately only the LED components themselves had been damaged and not the copper tracks where they were attached. All I needed to do was remove the remnants of the old LEDs and attach new replacements. 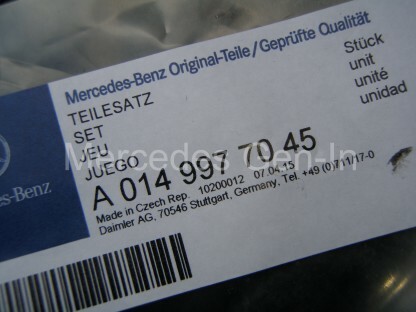 Please note: – I do have number of new yellow OSRAM SMD ultra-bright LEDs as used in Mercedes Benz consoles and if anyone has similar problems please contact me and I can arrange supply for a modest cost. Once the new LEDs were soldered in position (fitted to observe the correct diode polarity) the PCB was ready to be reassembled and fitted back into the van. 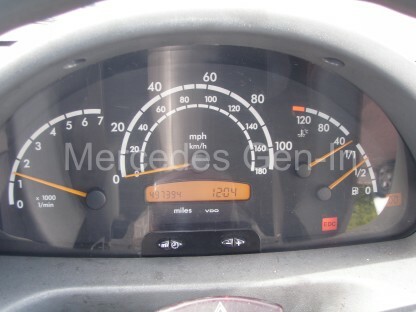 Once reinstalled the ABS fault was rectified and the ECU fault codes cleared. This correctly extinguished the ABS lamps and left the EDC lamp illuminated – correctly warning us of our next engine related problem to be rectified! 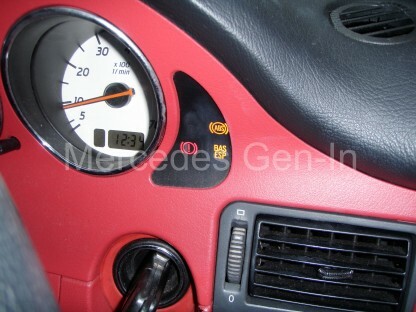 This issue truly highlights the importance of any potential Mercedes purchaser testing all the dash lamps in ‘ignition’ position to make sure all lights are illuminating correctly as they should in ‘lamp test mode’ before starting the vehicle. This point could easily be overlooked when buying a vehicle and turn out to be quite a costly oversight, so as you can see is this is a simple but very important check!